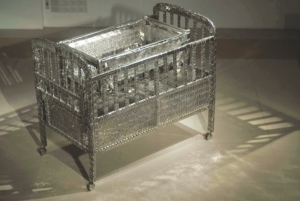 My Daughter's Cot, stainless steel, 2012. 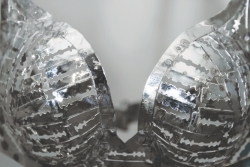 Being an artist who keeps stepping beyond boundaries, Tayeba Lipi is easily bored. She needs to constantly re-invent herself and find new projects to pursue. As a curator and co-founder of Britto she is always in search of subjects that will interest the viewer. Right now she is off to Nepal to curate an international exhibition. She's been to Nepal before, to Ireland, England, Norway, Sweden, Denmark, the Netherlands, Germany, France, Italy, Myanmar, Turkey, and China. “We went to it inspired by our network and Mahbub presented a paper there, triangle-based, as we belong to a triangular trust,” says Tayeba adding: “I was fortunate to be able to go to all the parts of the Indian sub-continent including New Delhi, Kolkata, Mumbai and the south of India." 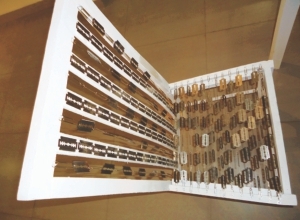 hangers and razor blades, 2011. She's been to Europe for the Venice Biennale, where she had an entry. Full of energy and aplomb, she is confident about the way she and her husband Mahbub are taking their organisation, Britto, to new heights. Sitting in the Britto office in Green Road, surrounded by black on white sketches of reptiles, animals, birds and mankind, one feels like one has come to a strange new world of fine arts, where video is mixed up with sketches, paintings and sculpture. 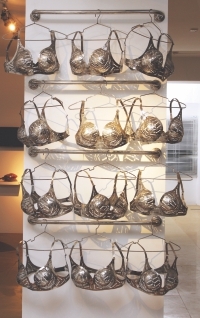 She has also used razor blades in not only her political creations in Pakistan, using 3,500 razors in each creation. Tayeba talks about the miniature work workshop Britto held and commented that it had been a huge success. Wasim Ahmed came twice, and in Dhaka there were well-known artists participating such as Fareha Zeba, Naima Haque and Jahan Nupur. The most successful workshop that she held was in Old Dhaka, titled 'One Square Mile', which dealt with the issue of environment. There were 40 artists from different trades such as photographers and architects, like Rizvana, who works on environmental issues. paint and etc, 2012. (detail below) Love Bed, stainless steel, 2012. Asked about what she aimed at doing in Nepal, Tayeba says that she is going to be the curator of the Nepalese Art Festival. There will be 35 artists participating from all over the world. The opening will be on December 25 and will last for three days. “As regards to many of my trips to Europe, like to Norway, I went just to see the paintings in the museums.” Britto is also curating The Kunst Plaai Festival in the Netherlands, where more than 70 organisations from all over the world will be participating.